Child exploitation, climate change, education reform, sustainable architecture and a host of other topics will be addressed at the second annual Fresh Outlook Foundation's REEL Change SustainAbility Film Fest set for Jan. 29 and 30 at UBC Okanagan. 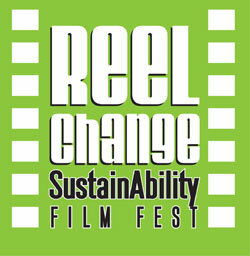 "REEL Change is a must-attend event for anyone interested in sustainability and the impact arts and culture can have to help raise awareness, dialogue and change," says Leanne Bilodeau, Manager of the Office of Workplace Health and Sustainability at UBC Okanagan. Her office partnered with the Okanagan Sustainability Institute and event organizer Joanne de Vries of the Fresh Outlook Foundation to host the festival on campus. The films are free and open to the public -- they will be shown in UBC Okanagan's Fipke Centre, which was built to reflect the most recent trends in green building design and construction. The film festival opens on Friday, Jan. 29 (7 p.m., Fipke Centre main lecture theatre) with a screening of The Age of Stupid - in which Oscar-nominated Pete Postlethwaite stars as a man living alone in the devastated future world of 2055, looking at old footage from 2008 and asking: why didn't we stop climate change when we had the chance? Following this screening, a panel discussion will include moderator Jennifer Chrumka of CBC Radio's Daybreak, Dr. Rosalind Warner from UBC Okanagan, and Randy Cleveland, Director of Infrastructure Planning for the City of Kelowna. On Saturday, participants will be treated to 10 documentaries about specific sustainability issues such as water conservation (One Water), the tar sands (H2Oil) and child exploitation (Playground). For more information, visit the UBC Okanagan Office of Workplace Health and Sustainability http://www.ubc.ca/okanagan/sustainability.